Since publication of the 1st edition in 2002, there has been a deep evolution of the global communication network with the entry of submarine cables in the Terabit era. Thanks to optical technologies, the transmission on a single fiber can achieve 1 billion simultaneous phone calls across the ocean! Modern submarine optical cables are fueling the global internet backbone, surpassing by far all alternative techniques. 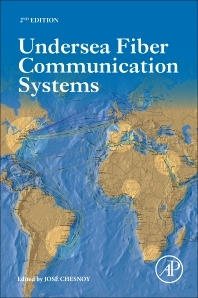 This new edition of Undersea Fiber Communication Systems provides a detailed explanation of all technical aspects of undersea communications systems, with an emphasis on the most recent breakthroughs of optical submarine cable technologies. This fully updated new edition is the best resource for demystifying enabling optical technologies, equipment, operations, up to marine installations, and is an essential reference for those in contact with this field. Each chapter of the book is written by key experts of their domain. The book assembles in a complementary way the contributions of authors from key suppliers acting in the domain, such as Alcatel-Lucent, Ciena, NEC, TE-Subcom, Xtera, from consultant and operators such as Axiom, OSI, Orange, and from University and organization references such as TelecomParisTech, and Suboptic. This has ensured that the overall topics of submarine telecommunications is treated in a quite ecumenical, complete and un-biased approach. Professionals (technical, marketing, product lines, etc. ), university faculty, advanced undergraduate and graduate students working in fiber optic communications. The editor, José Chesnoy, PhD, is a Submarine Telecom Expert with more than 30 years’ experience in the industry. He joined Alcatel’s research organization in 1989, and led the advent of amplified submarine cables. After heading the equipment Development of the Submarine and Terrestrial Network Divisions, he was CTO of Alcatel-Lucent Submarine Networks up to 2014. During the course of his technical career, he has been granted more than 50 patents in the field of fiber optics, organized many conference workshops, including the chair of the program committee for SubOptic 2004.